I’ve been enjoying a great book called “Green Glory: A Visual Tribute to the Courses of the Majors – Golf’s Renowned Venues.” This book shows vibrant and panoramic photos of golf’s major venues since 1950, along with paintings of them as well. Of course the major tournaments are the Masters Tournament, U.S. Open, Open Championship (British Open), and the PGA Championship. The photographer for the book was Patrick Drickey, a world renowned photog licensed by the PGA of America. How do I get that gig? The artist is Linda Hartough, from Harbor Town, SC. Naturally the first page out of the 250 I opened to was the Old Course at St. Andrews. What are the odds. No really. What are the odds? One in 250 and I turn to THE Old Course. Green Glory is full of some great imagery, and a little bit of useful information regarding each venue. This is a great coffee table book for days like today (12/19/13), where it has been snowing for 10 hours. I can thumb through it and reminisce about the rounds I’ve played on some of the courses within. I can dream of playing rest. 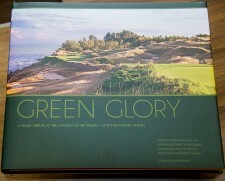 To pick up a copy of “Green Glory: A Visual Tribute to the Courses of the Majors – Golf’s Renowned Venues,” visit www.stonehousegolf.com. Retail is $75 for an autographed first edition and $55 for the book unsigned. This is crazy. I just opened the book again, to look for Chambers Bay. Chambers Bay is the host of the 2015 U.S. Open, the first venue in the northwest to host a major. I turned to the Carnoustie page again! What are the odds?